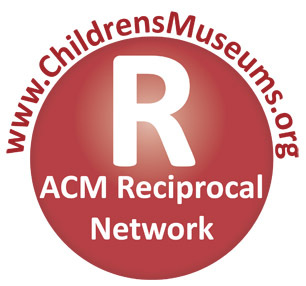 Supporting your local children’s museum by purchasing a premium family membership with ACM Reciprocal Network benefits at your home museum, entitles you to 50% off general admission for up to six (6) people at the Mid-Hudson Children’s Museum. Please note: There are no geographic or residency restrictions to this reciprocal admission benefit, however must hold a premium membership at your museum and your card must show the red “R” reciprocal button to receive this benefit. If you are traveling outside your local geographic area to Poughkeepsie and you are a member of a museum that participates in ASTC’s Passport Program, admission is free for the members listed on your card. ASTC reciprocity extends only to regular/general admission and does not include free admission to special events, fee-based programs, or StarLab planetarium shows. Based on your science center’s/museum’s location: Science centers and museums located within a 90 mile radius* of the Mid-Hudson Children’s Museum are excluded. Based on your residence: Museum visitors living withing a 90 miles radius* of the Mid-Hudson Children’s Museum are excluded. Check this list. to see museums located within the 90-mile radius of the Mid-Hudson Children’s Museum. Free admission is not extended to members of these museums, per the ASTC Travel Passport Program guidelines. * Please note: 90 mile radius is measured “as the crow flies” (a linear radius) and not by driving distance. You will be asked to provide photo ID as proof of residence in order to receive free reciprocal admission. Passport venues are not required to grant free admission to visitors who forget their cards. There is no universal database with all Passport visitors’ member data and expiration dates for admission staff to reference. Some venues will allow you to call the science center or museum you joined to confirm your membership, but they are under no obligation to do so.